Main scope of AstroMeTER is to provide to the astronomical community a simple and fast resource to perform metric calculations on science productivity of its members. NOTE: in case of multi-author, put author names separated by the symbol ";"
For example: AuthorSurname1, N.; AuthorSurname2, N.
The current beta release of the program AstroMeTER performs three kinds of bibliometrics calculations, named H, Contemporary H and G indices, respectively, both based on the citations retrieved for author's publication lists. The program exploits two of the most common publication search engines, for instance ADS and Google Scholar. The H index, also known as Hirsch index, was created by Jorge E. Hirsch, a physicist at UCSD, and presented in his paper "An index to quantify an individual's scientific research output" in November 2005. The index is based on the distribution of citations associated to a given author's publication list. 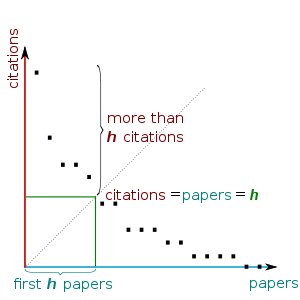 The concept behind H index is quite simple: an author has index H if his H papers, on a total amount of N ranked in decreasing order of citation number, have at least H citations each, and the other (N − H) papers have no more than H citations each, as shown below. More simply, an author with an index of H has published H papers, each one cited somewhere (basically in other papers) at least H times. Thus, the H index reflects both the number of publications and the number of citations per publication. The index is designed to improve upon simpler measures such as the total number of citations or publications. The index works properly only for comparing scientists working in the same field; citation conventions differ widely among different fields and search engines. For ranking scientists and journals, besides the Hirsch index proposed as pioneering metric, recently a modified version, known as Contemporary h index has been proposed. In an article of 2007 (Sidiropoulos, Katsaros and Manolopoulos 2007) the authors demonstrate several inefficiencies of the original H index and develop a pair of generalizations and effective variants of it to deal with scientist ranking and publication forum ranking. The new citation indices are able to disclose trendsetters in scientific research, as well as researchers that constantly shape their field with their influential work, no matter how old they are. where g is an empirical constant fixed to value 4; C(i) is the number of citations of paper i; Published_Year(i) is the year of publication of paper i and d is the exponent fixed to value 1. Then the contemporary h index is calculated as the traditional h index applied on the resulted normalized citation list (by opportunely re-ordering of publications in decremental citation order). See the publication cited above for more details. The G index, also known as Egghe index, was created by Leo Egghe, who presented it in his paper "Theory and practise of the g-index" in the 2006. Like H index, the concept behind G index is simple: given a set of publications ranked in decreasing order of the number of citations, the G index is the (unique) largest number such that the top G articles received (together) at least g2 citations. It is indeed evident that the G index is useful for quantifying scientific productivity based on publication record. The G index has a quite obvious property: it states that by moving citations from weaker articles to stronger articles, one's research index should not decrease. By directly comparing H and G values, it results clear that both factors are strongly correlated. However, these factors are conceptually distinct, in the sense that the G index attempts to address shortcomings of the H index. Journal Impact Factor is from Journal Citation Report (JCR), a product of Thomson ISI (Institute for Scientific Information). JCR provides quantitative tools for evaluating journals and the impact factor is one of these. It is a measure of the frequency with which the "average article" in a journal has been cited in a given period of time. Impact factor of Nature, Science and Cell journals can be found on their journal websites. The lists of Impact Factors cannot be published on this site due to copyright violations. Science Watch provides ranking and impact factor for selective journals. The complete list is located at this address. The impact factor can be used to perform a fine tuned evaluation for an author, after a publication search with option "grouping by journal name" enabled in the calculation form. It infacts reports also normalized citation number (i.e. citations/num_authors). As introduced above, the current beta release of the program exploits two bibliography search engines: ADS and Google Scholar. It is also to be remarked that the main reference for all calculations is the ADS outcome. Google Scholar is less reliable in terms of publications, but it is more powerful to find an higher number of citations. This is because it is able to search for citations in a wider range of internet sources than ADS. The choice has been basically driven by their common practice and frequency of use in astronomy bibliography search. Other resources, like Spires, or Mendeley have been also put in the program release progress pipeline. 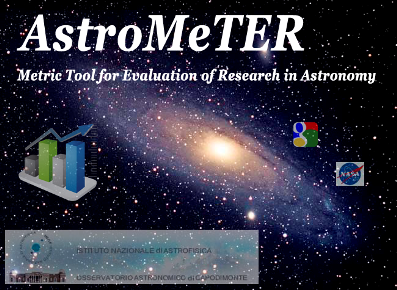 One of main scopes of the AstroMeTER program is to provide to the astronomical community a simple and fast resource to perform metric calculations on science productivity of its members. Together with the enhancement of this resource through the integration of mentioned database engines, it is also foreseen to provide other metrics, based, for instance, on more fine search options, by using the specific impact factors of single journals. As known, in fact, the H and G indices are only indirectly related with the different journal ranks, which however may have a more relevant impact in the research productivity evaluation of a scientist. The program is under frequent update and it is open to the community. Suggestions, bug reports, new ideas are always welcome and encouraged! The current beta 4 release of the program has been enhanced by calculating the Contemporary H index on the ADS+GOOGLE publication citation list. The current beta 3 release of the program has been enhanced by "Exact Name Matching" feature (the analogous option of ADS to cause the search engine to return only records for which the author has been entered). The current beta 2 release of the program has been enhanced by "first author search", "refereed search" and "grouping by journal name" features. The current beta release of the program performs two kinds of bibliometrics calculations, named H and G indices, respectively, both based on the citations retrieved for author's publication lists. The program exploits two of the most common publication search engines, for instance ADS and Google Scholar. The latter is basically used to optimize the citation number search done by ADS. ADS typically accepts author name with Surname followed by first name initials. It is strongly suggested to separate surname and names by a comma (i.e. Surname, N. or Surname, N. M.). Google is compliant with such format, although it accepts also surname and names without comma. See below for multiple author cases. Occasionally, ADS assigns publications with a date updated to the next incoming year. For example, it may happens that during last 3 months of a year, ADS registers a new publication with a future date projected at the next year. In thse cases, to avoid false errors, the user must select the proper publication year in the "END Year" field of the form. For example, a publication registerer in October 2015 but with 2016 as the publication date fixed by ADS would cause an error "divide by zero". In this case, to avoid errors, the user must select "2016" as "END Year" in the form. In case of author multiple first initials, the search is done in a restricted way. For instance, if author name filled in is Surname, A. B., the search will be done by taking the complete specified name. Publications for the same author, where he is present as Surname, A. or Surname, B., could be lost. This is to prevent possible homonyms which could affect the results. The first-author search filter enable to retrieve only publications where first author corresponds to the author subject of the search. In case of multiple author search, this filter works ONLY if search logic is OR. Otherwise a failure message will be reported. Authors must be entered on the field line separated by semi-colons. Authors may be entered by last name only, by last name and first initial, by last name and first name, or by last name, first name and middle name (as usual in ADS engine web interface). By checking the Exact name matching button above, it will cause the search engine to return only records for which the author has been entered. For example: if you type author name smith, j without checking the option, authors like smith, j f and smith, j, or smith, jason f are considered as valid names to be searched. If you enable the option the only valid author name smith, j will be searched. The grouping by Journal name option will report a list of retrieved publications grouped in subsets, each related to a specific journal or edition. This feature is a good starting point to perform an evaluation by taking the journal impact factor into account. The grouping by Journal name option will report also the total number of authors and normalized citation value (i.e. citations/num_authors) for each publication. The grouping by Journal name of retrieved publications is related to ADS search results. If only Google scholar search is enabled, the grouping will not produce any result. The reason is that Google Scholar does not use internal unique key codes for publications. Multiple author search can be done by separating each author by symbol ";". In case of multiple author search, to calculate H and G factors for each specified author, remember to select the OR logic option. Otherwise with default AND logic, a unified H and G factor calculation will be done for ALL authors together. In case of multiple authors search, the option FIRST-AUTHOR is only compatible with OR logic, in which case first author publication search and calculations are done for each single author. Don't use multiple author search with both AND logic and first-author options enabled! Google Scholar is unable to distinguish between "refereed" and "others" publications. If you select "refereed" search option, the ADS publications have to be considered as reliable. This option, if enabled, will report all publications, fully described (i.e. title, authors, journal, citations), during all steps of the search process. In case of an high number of publications, the verbose output could be very long with many repetitions. We suggest user to enable this option only if really needed.